Rugged design for commercial use with a high efficiency motor, and comes with a button clip and safety strap. 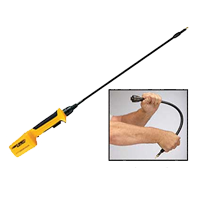 Patented one-piece molded handle provides durability and moisture resistance. An optional rechargeable battery pack and charger are available. The High Performance 200 includes a 2-year electronic warranty. Comes with a high-powered and longer-lasting rechargeable battery and a button clip and safety strap. Patented one-piece molded handle provides durability and moisture resistance. This unit has a rugged design for commercial use and a high efficiency motor. 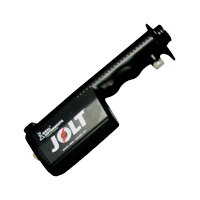 An advanced electronic charger is included along with a 2-year electronic warranty. Great prod for an economical price with the latest motor technology. It’s lightweight and has an ergonomical grip for comfort and ease of use. Works under both wet and dry conditions. The Value 100 includes a 1-year electronic warranty. Available in: 23″, 36″, 48″. The finest livestock prod on the market today, the DuraProd is designed for user comfort and safety. Features include patented technology to reduce feedback shock, sealed circuitry, rubber handle grip to reduce fatigue, oversized trigger, hand guard, built-in safety switch to reduce accidental use, and snap-on battery pack (included) for fast battery changes without tools. Hot-Shot continues to lead the industry with our dependable, commercial-strength prods. Every unit is factory tested to high performance standards, making it the ongoing brand of choice for farmers, ranchers, and professional stock handlers and haulers. When used correctly, electric prods are a safe, humane way to aid in the movement of livestock; be sure to read and understand all documentation included before using this product. Four C-cell batteries included. 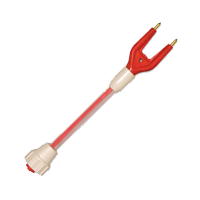 Available in: rechargeable model; other shaft lengths and styles are available (from 32″-48″). The Green One is a rechargeable battery-operated livestock prod delivering unparalled performance in all conditions, especially on wet animals. Hot-Shot continues to lead the industry with our dependable, commercial-strength prods. Every unit is factory tested to high performance standards, making it the ongoing brand of choice for farmers, ranchers, and professional stock handlers and haulers. When used correctly, electric prods are a time-tested, humane way to aid in the movement of livestock; be sure to read and understand all documentation included before using this product. 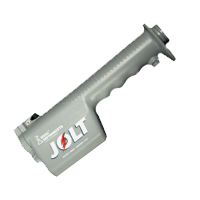 Permanently sealed, maintenance-free solid-state motor resists damage by dirt or moisture. Unique safety clip prevents accidental use. Rechargeable battery pack and latigo carrying strap included. 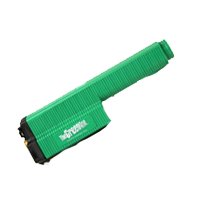 Available in: alkaline battery model; other shaft lengths and styles are available (from 32″-48″). 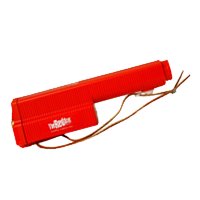 The Red One is a battery-operated livestock prod at an economical price. Hot-Shot continues to lead the industry with our dependable prods. Every unit is factory tested to high performance standards, making it the ongoing brand of choice for farmers, ranchers, and professional stock handlers and haulers. When used correctly, electric prods are a time-tested, humane way to aid in the movement of livestock; be sure to read and understand all documentation included before using this product. Permanently sealed, maintenance-free, solid-state motor resists damage by dirt or moisture. Latigo carrying strap and six C-cell batteries included. Available in: lengths and styles are available (from 32″-48″). Unit includes sound makers in the paddle, and a golf club grip. 48″ Long. 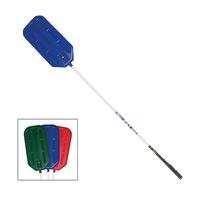 The Hot-Shot Sorting Paddle delivers dual stimuli for sorting livestock of all types. The brightly colored, 6.25 inch-wide paddle creates a visual barrier to guide livestock; they also respond to the sound of the BBs inside the paddle. Features a comfortable golf-style grip and vinyl covering for protection and easy cleaning. Available in: 42 inch long including handle; available in 48 inch length and several colors. A variety of color options available. Options in both wood and plastic, by a variety of manufacturers.